Certain personal objects follow us through different moments of our lives. You never think about them. But they’re just always there. You might move to a different city, or even another country, but you always keep them for some reason. Our mugs are like this. 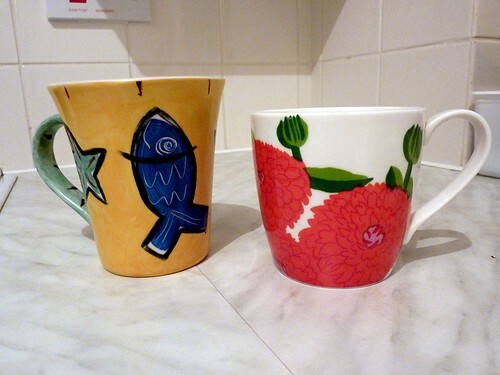 My mug, the yellow one with a fish, was a present from my mother when she came to Espoo to visit us for the first time in Finland. She came to spend our first Xmas abroad with us. This was in 2006. It’s a mug from Recife, Pernambuco. It quickly became my favourite because it was larger and cuter than the ones we used to have — some dull green mugs from Ikea. My wife’s mug, the white one with red flowers, was a gift I gave her on the Brazilian Valentine’s Day (June 12). I bought it at Iittala, a nice Finnish design shop. For instance, they sell those classic Alvar Aalto‘s amoeba-shaped vases. The mug has been her favourite mug since then because it’s simple and stylish. Those mugs has been with us for 3-4 years. We brought them from Finland to England. They carry some happy memories in them. So, why not keeping them, right?